The Maine Wood Carvers Association, a private non-profit organization is a system of local chapters dedicated to promoting and encouraging wood carving and creating interest and skills within the State of Maine and beyond. Established in 1984 as the Maine Wildlife Wood Carvers Association under the leadership of Phil Foster, the initial meetings were held monthly at the Student Center at the University of Maine at Farmington. A logo contest was held and Tom Foley's entry was chosen.The first issue of the Maine Carver was published on August 4, 1984 by Steve Gwazdosky. Jim Fawcett took over as editor shortly after that and continued for many years. The newsletter's masthead was designed by Betty Foley. The newsletter serves as a vehicle to communicate with our widespread membership. Sharon Miller coordinated the First Annual Down East Wildlife Carving and Art Festival held at the Samoset Resort in Rockland on August 2 and 3, 1986. The show was an exhibition, display, and sale geared to the collector of Wildlife Art. 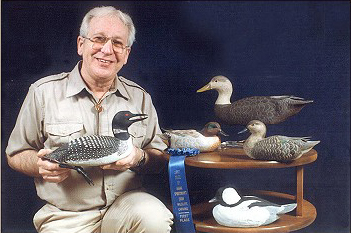 The only contest at the show was a duck head challenge. Contestants picked up a sawn-out blank and registered at the MWWCA booth on Saturday morning. The finished head was turned in on Saturday evening. After judging and the presentation of ribbons, the top four heads were auctioned off on Sunday during a silent auction. It was not long before our membership was composed of talented carvers from just about every corner of Maine. In September of 1989 the by-laws were changed to include Chapters around the State. The Chapters were charged with being responsible for their own meetings and programs freeing the Board of Directors to focus on public relations, competitions, shows, fund raising activities, and broader educational programs. Early Chapters included the Pine State Wood Carvers in Farmington, The Lovell Chapter in Western Maine, the Waterville/Augusta Chapter in Winslow and the Southern Maine Chapter in South Portland. At the October 1994 Downeast Wood Carvers and Wildlife Art Show at Thompson's Green in Ogunquit, a carving competition was added to the exhibition. The competition included open, novice and youth divisions. There was no intermediate division. The open division had cash awards plus ribbons in most all classes. The novice and youth divisions had only ribbons and trophies. * position held for 2 mos.